this is our 4n1 Curvy Combo! Its called the Curvy combo because of the curves it has underneath its slide, and the curves it has on top of the slide. This is a single lane slide and can be rented either DRY and it comes with a bumper or wet and we add a pool to the end. This Combo features a large bounce area, a climb, a basketball hoop and a slide. 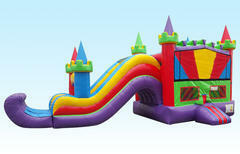 aslo we have added an inflatable ramp to keep the kids hands and feet clean when entering or exiting the bounce house. The set up area is 38 L x 20W and 16 H, if you are renting at a park you will need to add a generator to your cart and this unit can only be rented dry at parks. accomodates kids 2yo-13yo no adults.